After the first month of the year, we’re able to evaluate Victoria Real Estate in January 2019. We’re seeing the slow down of sales continue, and inventory is rising with more homeowners deciding to list their property than in the past couple of months. Overall in Greater Victoria Real Estate, we saw a total of 329 properties sell in January (24% fewer than January in 2018). 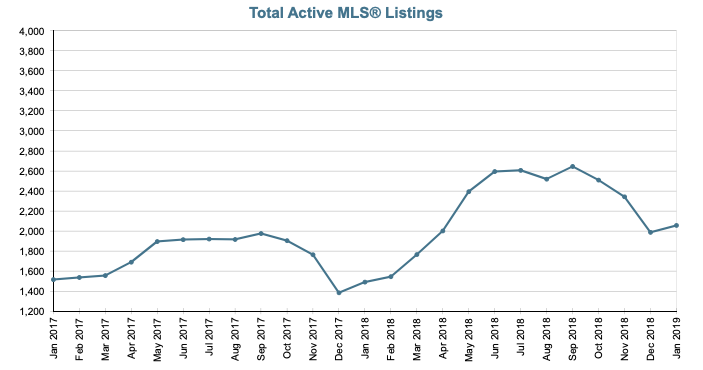 However we saw a total of 2,057 active listings at the end of January this year, a 38% increase from 1,491 active listings at the end of January of last year. While overall sales were down 12% from December to January, condo sales were up by almost 8%. In the past month we’ve still continued to receive multiple offers on some of our listings, showing that the right property at the right price, with the right marketing, is still highly sought after. However, the average days to sell have increased to 48 days, compared to 23 days in January of 2018. That being said, the overall market is moving at a different pace, typically giving buyers more time to make decisions, and find the right property. See our video blog for our 2019 market predictions. To read the full real estate January statistics report from the Victoria Real Estate Board, check it out here.